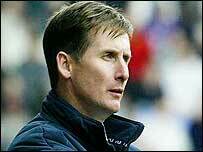 West Ham manager Glenn Roeder remains in stable condition in hospital following his collapse on Monday. The 47-year-old was rushed to hospital after being taken ill with chest pains following West Ham's 1-0 Premiership win over Middlesbrough. Scans revealed he had a blocked blood vessel in his brain. "The family of Mr Glenn Roeder would like people to know that the situation is as it was and Glenn continues to be in a stable condition," said a statement by the West Ham manager's family. On Tuesday the hospital had revealed he had had a stroke. "We can confirm that there has been a blockage of a minor blood vessel in his brain," said hospital officials in a statement. "Doctors are continuing to carry out tests and will be in a position to make a fuller diagnosis once these are completed." Doctors have ruled out a heart condition but it is not clear how long Roeder, whose team is battling relegation from the Premiership, will stay in hospital. The Hammers have appointed Trevor Brooking as caretaker-manager for the final three games of the Premiership season as the team battle against relegation. Roeder, who lives in Essex with his wife Faith, two sons and a daughter, has faced immense pressure in recent months to avoid the drop to the First Division. Roeder was heckled by unhappy Hammers fans urging him to quit after the 1-0 defeat against relegation rivals Bolton on Saturday. He was also booed on Monday prior to Trevor Sinclair's 75th-minute winner against Boro. Roeder attended the post-match news conference but later collapsed. West Ham are battling to avoid relegation, but striker Jermain Defoe told The Sun newspaper that Roeder had been handling the pressure well. "Every day he has been smiling and chatting away as if nothing is going on. I have been amazed by the way he has handled it all," said Defoe. "He hasn't shown any ill-effects at all. In the last few days he has been fighting fit and ready to face the next challenge." Roeder's predecessor at Upton Park, Harry Redknapp, added: "The game can get you like this. "People don't realise what you go through as a manager and the pressure you put yourself under. "Especially with the season he's had. The pressure has built and built and now it's cracked." "The intensity of the job has escalated"
"Glenn seemed his usual self"